Home / Blogs / Bottle up! We started bottling our beers way back in January 1995. Sales that month? Just 4 cases of Fuggle-Dee-Dum ! This rose to a majestic 39 cases in February. Since then sales have progressed nicely, thank you – last year we sold 12,000 cases and the grand total now stands at 130,000 cases. That would be less than an hour’s output for Carlsberg, no doubt, but not too shabby for a small craft brewery that cares about the quality of what they produce. We have always brewed the beer destined for bottling here, then shipped it in bulk to the mainland for a contract bottler to package for us. We’ve always been conscious, though, that this eats up a lot of food-miles and is expensive, too. So last summer we took the decision to install a bottling line here to do the job ourselves, and to create and keep jobs on the Island. 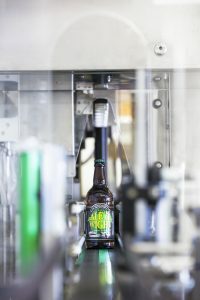 It also fits in with our ‘local’ policy like using Island grown malt to maximise the Isle of Wight connection. In a former life we used to have a vineyard in East Cowes and at the time, remember lusting over GAI bottling machines made in Italy. It didn’t take long to settle on a GAI 661 monobloc bottler as the focus of the new line. Italian (we’re afraid) labeller and shrink-wrapping machines were added to go with a Chinese (boo! – but fantastic value) carbonation tank and British (hurrah!) filtration equipment. Total cost of this lot? £150,000+. We were very grateful for a modest, but pretty vital, grant from the Local Enterprise Partnership. Even after the grant, it has been a hefty investment for a small brewery to make, but one I doubt we will regret. Our first run was at the end of March this year, and we’ve already passed the 60,000 bottle mark. The GAI machine is ‘fly-by-wire’ and telemetry is connected via the internet to the factory in Italy in just the same sort of way as Formula 1 race cars are. Whilst I sometimes think this just adds complication to the whole thing, nonetheless, it’s startling to see the operating console come to life with someone in Italy making adjustments to sort out problems.